Art and Civil Resistance: the Work of Andrea Bowers | A discussion of the history of art as an outlet for nonviolent resistance and the work of contemporary visual artist Andrea Bowers. A discussion of the history of art as an outlet for nonviolent resistance and the work of contemporary visual artist Andrea Bowers. What is Nonviolent Civil Disobedience? I had the opportunity to conduct an email and phone interview with the artist on Saturday and Monday, March 9th and March 11th, 2013. She answered the following questions, which further illuminate her position on the relationship between art and activism. Hopefully, after reading the artist’s responses, the viewer may be compelled to view her work with even a new perspective and understanding of her role in the tradition of nonviolent resistance. 1) Have you studied the tradition of nonviolent resistance and leaders such as Gandhi and King? If so, how have they influenced your trajectory? AB: I was definitely influenced by them but most of my influence comes from direct action training sessions I have attended given by young activists. Lately I’ve been struggling with the blurry boundaries between violence and nonviolence. These definitions are not always clear. It’s a matter of degrees so I always try to keep this in mind. Is cutting a hole in the fence of a nuclear ammunitions factory, in order stop the production of nuclear weapons (like the Plow Shares), a violent act? Some would think so. Can trespassing be violent? An act done for necessity of defense may have violent aspects but can still be more peaceful than a violation of greater injustices and human rights. I have been very influenced by Barbara Epstein’s book, Political Protest and Cultural Revolution – Nonviolent Direct Action in the 1970’s and 1980’s. Also I studied Gene Sharpe’s books on The Politics of Nonviolent Action. I probably learned as much about nonviolence from the Black Panthers as I did King. I was early on influenced by Dorothy Day. Lately I’ve been trying to live my personal life in a nonviolent manner, something which is much harder than enacting NV strategies in my political life. This is where Gandhi comes in (see his text “My Faith in Nonviolence” 1930). I produce work in an archival manner. I research and collect materials and then use the information to help make my work. All of my ideas come from the research. I often just shift the frame: I see readymades in the materials and actions of nonviolent protests. I just enact these activists’ practices and put them in galleries and then that’s about it. I add some tropes from the visual vernacular of aesthetics to elicit pathos sometimes. Many of ideas particularly early on in my work came directly from the texts I mentioned above. Literally the tree sitting platforms are made by a tree sitting activist. He comes to visit me from northern CA where he has been living in a tree for the past 3 years in order to prevent it being cut down. I have borrowed materials from actions, put them in exhibitions and after the show they are used for actions again. 2) What role do you think art plays in the realm of civil resistance, and why is it important for art to be political? Categories Who is Andrea Bowers? 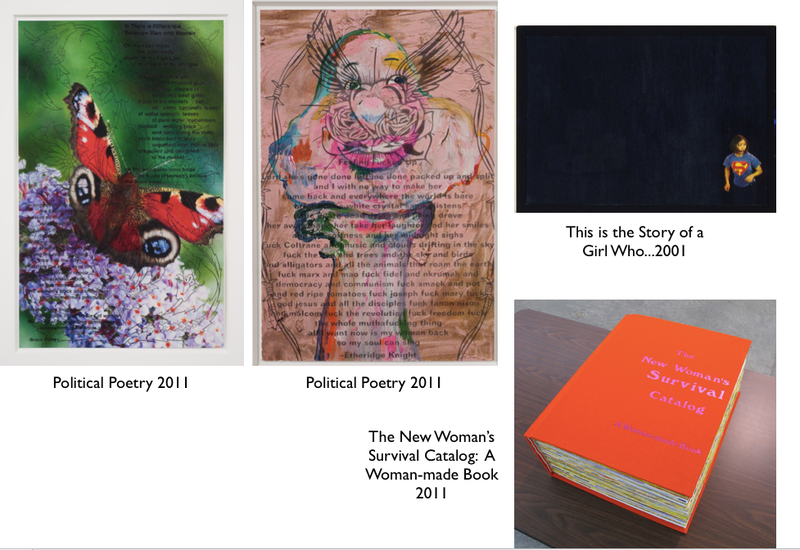 The following images show more examples of Bowers’ artwork. By both reading the title of the work and looking at the image, one can further understand the role of the political context within Bowers’ work, and also her frequent attempt to portray the work of activists. Following with her trend of making art purely about activists, in 2009 Bowers finished a video that documented her experience working with tree-protest activists to train for, and ultimately participate in, tree occupation. In her 2003 video Vieja Gloria, Bowers began documenting the first suburban tree sit-in over the proposed removal of a 400-year-old oak tree Old Gloria in Valencia, California. The video featured activist John Quigley, who soon convinced Bowers to train with him and prepare for future tree protests. Her 2009 video Nonviolent Civil Disobedience Training– Tree Sitting Forest Defense presents her experience, which she later put to use at a tree-sit-in in Arcadia, California. Bowers was ultimately arrested following the 2011 tree sit-in. 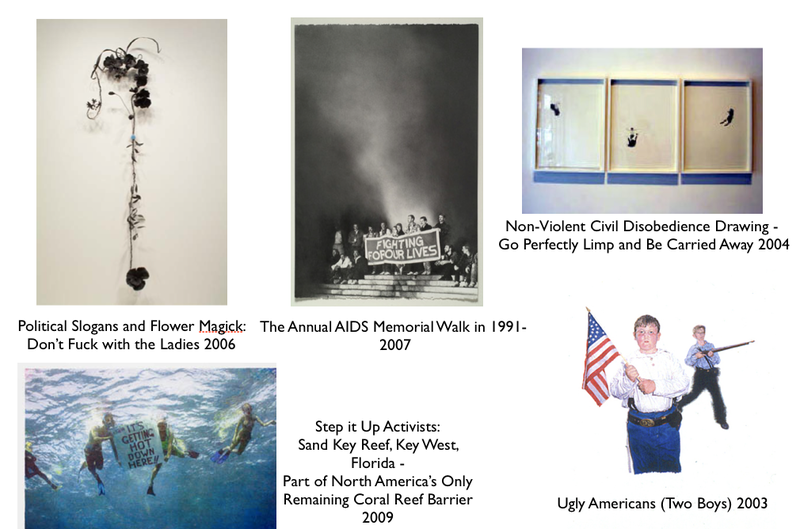 In a video and series of stills and drawings, Bowers returns to the direct recognition of nonviolent civil disobedience in her artwork and also to the controversial political issue of immigration which she frequently highlights (as in No Olvidado). The silent film features undocumented Mexican immigrant Elvira Arellano and her 8-year-old son, a US citizen. On August 15, 2006, Arellano entered into sanctuary at the Adalberto United Methodist Church in Chicago, IL in order to avoid deportation and separation from her son. After following Arellano’s story for over a year, Bowers interviewed and filmed Arellano two weeks before her one-year anniversary in sanctuary. Through the video and accompanying drawings, Bowers continues exploring direct action and nonviolent civil disobedience by attaching a human face to a contentious issue. She not only presents a personal story as a way of commenting on the heart-hardening effect of a politically contentious issue, but also to consider the intersections between aesthetics and political protest. Many of Bowers’ earliest work feature staunchly feminist subjects and highlight the role of women in contemporary society and culture. 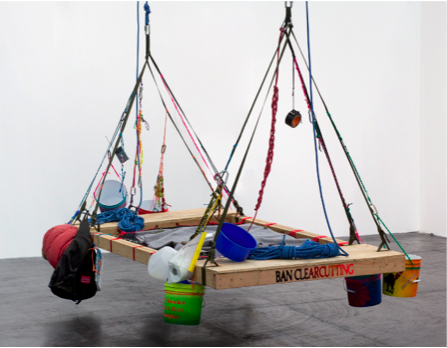 Her 2012 exhibition “Help the Work Along” returns to the genre of feminist-centric issues that focus on the rights of female workers, and discusses the relationships between feminism, immigration, and workers’ rights– all political subjects Bowers frequently considers. Overall, the exhibit celebrates “workers’ rights movements, highlighting nonhierarchical labor organizing strategies and the use of craft, artistry, and pageantry as valuable political tools.” Through a juxtaposition of workers’ rights images and graphics from the early 20th century with contemporary political posters and campaigns, Bowers compels her audience to evaluate the notion of “emancipatory progress.” Suffering and exploitation of workers is not a historic event relegated to the past; it continues to happen on a daily basis in our own cities. In 2004, Bowers presented a complex project that incorporated the use of various mediums of art. The centerpiece of the exhibit, Nonviolent Civil Disobedience Training, featured a two-part video project, in which ten dancers in their 20s participate in a direct action training course taught by nonviolent activists and educators. In addition to the education portion, the video also features a dance performance, with photographs and a drawing accompanying the video project. Firstly, the education portion of the video is portrayed as a stimulating physical and emotional process that draws attention to the relationship between the content and the personal emotion of the dancers. Next, the dancing section further highlights the connection of aesthetics serving as a successful ally to the political theory.